From where to obtain money orders to filling them out, everything you need to know in a nutshell. A money order is one of the most widely and earliest methods of sending cash. It was an expensive method in the beginning, but over time it has become highly cost-effective and reliable. The creation of the Postal Order System played a big role in its success. The United States Postal Service used to send money in currency before it switched over to money orders. This provided it with a much safer alternative. This guide introduces you to this method of sending and how to get one near you. 1. 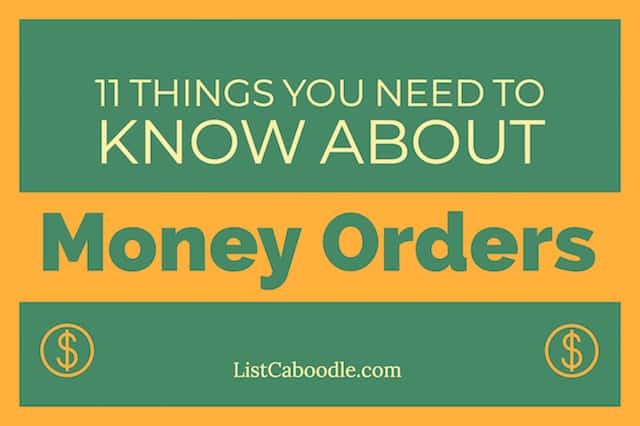 What is a Money Order? Even when it is among the most prevalent forms of sending money, most people are thinking of how to get a money order when they want to send funds to someone. A money order is a government or bank issued certificate that allows the payee to receive cash. These certificates can be readily converted into cash and are excellent modes of funds transfer for those without access to a usual checking account. It is a trusted mode of payment because the specific amount is prepaid. American Express was the first company in the country to issue them back in 1882. 2. How do Money Orders Work? When you want to send money to someone, you can purchase one and fill out the recipient’s name and amount in the form. Usually, it is limited to $1,000 each. So you will have to purchase multiple orders to send a higher amount. Besides the amount you want to send someone, you should also consider the additional fees charged by the post office or financial institution. When you buy a money order, you will get a receipt with a unique serial number. This receipt can be used to trace it and you should keep it until the payment has been received at the recipient’s end. When it comes to the recipient, they can clear the payment from several places that can include USPS post office, bank, credit unions, and MoneyGram/Western Union agents. This can also include grocery stores and convenience stores. However, some issuers will accept only those orders that have been issued by their own chain. There are many places where you can get a money order to send funds to someone or to pay a bill. Almost 9 in 10 Americans live just minutes from a Walmart. Walmart outlets deal only in MoneyGram-issued orders. You can send an order of up to $3000 per day by paying a fee of $0.70 per $1000. Besides cash, payments can also be made in Walmart MoneyCard and your debit card. So if you are looking for a location where can I buy a money order, you should look for the nearest Walmart outlet. Business Hours: A Walmart Money Center remains open 8am to 8pm on Monday to Saturday and between 10 am to 6pm on Sunday. Many banks allow you to send payments using this method. Chase issues its own orders. If you are a Premier Platinum Checking account holder with the bank, there is no fee. Otherwise, it charges $5 for an order up to $1000. Payments can be made in the form of debit card, credit card, cash, and direct debit from your bank account. Business Hours: Chase Bank remains open 9am to 6pm on weekdays and 9am to 4pm on Saturday. It remains closed on Sunday. The fees and limit are the same for most other banks. Some of these other locations include Bank of America, Bank of the West, Citibank, TD Bank, BB&T, M&T Bank, Wells Fargo, PNC Bank, and US Bank. The payment options are also similar between all these banks – cash, debit/credit cards, or direct debit from account. The post office is amongst the most reliable places where to get one near me. The United States Postal Service (USPS) offers its own orders. You can send payments of up to $1000. It charges just $1.65 for orders up to $1000 and $1.25 for up to $500. If you want to send international payments, USPS money orders are accepted in more than 25 countries. It is also the official issuer for government payments. Many government agencies accept only USPS versions for payments, not from other issuers. You can buy the orders through cash, traveler’s check, and debit card. Business Hours: Post offices remain open 9am to 7pm, but the times can also vary slightly from one location to another. Western Union: There are over 56,000 Western Union locations for you to buy it from. You can find Western Union’s locations here. There is no need to have a bank account. It allows you to send the payment in person or through mail. MoneyGram Outlets: You can easily find a MoneyGram agent in your area. Even a small town can have 3 to 4 agents. MoneyGram has become so popular that it has almost become synonymous with the term ‘money order’. You can easily find a location near you using this Monegram locations link. Credit Unions: You can also get one from a credit union near you. Almost all unions require you to have an account with them to send money. The Golden 1 Credit Union issues its own order and sells only to its members. It charges $5 per order and has a maximum limit of $1000. Modes of payments include cash and direct debit from account. Business Hours: The offices remain open 7:30am to 7pm on weekdays and 9am to 5pm on Saturday. The Navy Federal Credit Union issues Western Union orders and offers a relatively very high limit of $10000, charging $14.50 per order. Security Service Federal Credit Union offices are also ideal locations near you. They issue Traveler’s Express (subsidiary of MoneyGram) orders and charge $2 per order with a maximum limit of $1000. You can also purchase them from a pharmacy near you. CVS and Rite Aid are excellent examples. CVS issues MoneyGram orders while Rite Aid offers Western Union certificates. Both accept only cash payments and have a limit of up to $500 with a fee of $0.99 per order. Business Hours: Pharmacies are mostly open 24/7, so you will be able to purchase them almost any time. Check cashing stores usually have lower-limit orders but they charge a very small fee. In fact, Amscot can issue you one up to $1000 without any fee. It issues its own order certificates. Check Into Cash issues Western Union orders and the limits and charges vary from one place to another. Speedy Cash is another place where to get one near me, with varying limits and fees. Interestingly, buying one can sometimes be as simple as visiting a discount store or super store near you. Kmart has stores in most cities and towns and you can visit one to buy a Western Union order. They sell orders of up to $500 for a fee of $0.70. You can buy it using debit card or cash. Business Hours: Kmart stores remain open 8am to 10pm all days. The timings for buying and receiving these can vary from one location to another. Grocery stores can be convenient locations. In fact, you can also find them open on the days when post offices and banks are closed. Albertson’s issues MoneyGram orders and accepts cash and card payments. The limit is $500 with fees of $0.89 per order. Family Fare issues Western Union certificates with maximum limit of $500 and fees of $0.70. Payments can be made using the same modes. Some of the other grocery stores selling them include Dillons, Food Lion, Food City, Fry’s Foods, H-E-B, Fred Meyer, Harris Teeter, Giant Eagle, King Soopers, Jewel-Osco, Kroger, Safeway, Stop & Shop, Publix, Meijer, Smith’s, ShopRite, and Schnucks. Many convenience stores and gas stations near you can also sell them. Almost all of them accept cash payments. 7-Eleven offers both MoneyGram and Western Union certificates and charges 1% to 3% of the amount with a limit of $500. Circle K issues MoneyGram orders with a limit of $500 and a fee of $1. SpeedWay also issues MoneyGram orders with same limit and charges $1.59 per order. You can buy Western Union orders from Stripes for $0.89 for a maximum of $500 order. You can also purchase it from a Royal Farms and QuikTrip outlet if there is one near you. 4. How to Fill Out a Money Order? Write the Recipient’s Name: Write the name of the payee against the line that says ‘Pay to’. It can be a person or a business, and it is important to spell the name correctly. Fill Own Address: This line will usually mention ‘purchaser’s address,’ and refers to the sender. It is recommended to include your name when writing your address. Some forms have the ‘from’ section so that you can write your name. Additional Information: If you are paying a bill, the form can also have a line saying ‘account number’. Some forms have a ‘memo’ section where you can include all the relevant information about the purpose of sending the funds. Signature: All forms will have a section on the front where the sender must sign. Once you have filled the form, tear off the receipt and keep it safe with you. 5. How to Cash a Money Order? Take it with you to the location. This can be a bank, credit union, check-cashing store, or grocery store. Wait in line for the customer service agent or teller and sign on the back of the order when they ask you to. The service agent/teller is going to ask for a valid identification. So make sure to carry a government-issued ID along. Pay the fees required or the fee can be debited from the cash you receive. Post Office: If it has been issued by the USPS, you can visit a local post office to cash it. It is free to cash a USPS one from a US post office. Before you go to a post office, it is important to know that they make payments only against USPS-issued orders. If you receive an order with a large amount, it is recommended to call the branch in advance. They are able to make payments only if they have enough money on hand. Banks/Credit Unions: Most banks will cash one for non account holders, but for a small fee. There may be a limit up to which they may serve a non account holder. If you have an account with a bank or credit union, it is highly likely that they can cash it for free. A non account holder with a big amount may be required to open an account with them. Western Union: You can cash your money order from most Western Union agents, but with a little fee. You can easily find a location from their website. Even a small town can have 4 to 5 agents. It is again recommended to call an agent before you visit to cash out an order with a large amount. Walmart: If you have a Walmart-issued version, you can cash it from a local Wal-Mart near you. If it is worth $1,000, you should expect to pay around $3. If you have a MoneyGram agent nearby, you can visit them because Walmart issues only MoneyGram versions. MoneyGram: You can find at least half a dozen MoneyGram agents in a town, so cashing their’s should be convenient. The cash out fee is also relatively lower. You can also visit other outlets to cash this order. Many grocery stores can also make payments against MoneyGram and Western Union versions. However, there are stores that don’t offer this service in any of their branches. This includes Aldi, Dollar General, Target, Costco, Walgreens, and Trader Joe’s, to name a few. There are some similarities between the two, but they are different in more ways. While money order has its positives over the cashier’s check, it also has some cons. Options to this payment method include personal checks and a wire transfer. Convenience: One of the main advantages is that they are easier to get. Anyone can purchase an order to send funds to someone. If that is not much, you can buy them from a wide range of places – even from a small shop or pharmacy near you. It is among the easiest ways for sending money to anyone. Besides, there is no need to have a bank account to issue it. Cost-Effective: It is cost-effective to send money using this method. The average processing fee is going to be maximum $5. The fee usually starts from just $1. Lower Security: A bank will usually insure you against mistakes or frauds in a more effective way compared to other outlets. This means that while one with errors would go through, a cashier’s check gives you the chance of getting the money back. Lower Limits: A money order has a lower limit compared to a cashier’s check. The limit varies between banks, but it can be as high as $5,000 with many. Even larger amounts can be allowed but they have to go through a confirmation process. Money order provides an inexpensive way to send funds to someone, to make purchases, or to pay bills. Usually, you will be charged around $1 per order in most retail outlets. Banks and credit unions can charge you up to $10. The USPS is considered as a safe and reliable place to purchase orders, costing $1.25 per certificate of up to $500 and $1.65 per certificate up to $1000 for sending money on American soil. You can also send international versions through USPS, costing you more. You will find that the fee varies from one town to another and from one store to another. It is also likely that some stores selling money order in other towns may not even be selling them in your area. Ask for availability and fee before filling out the form. 8. Can I Buy with a Credit Card? Only a few institutions and outlets can accept credit cards. Most of the banks accept this payment option. This includes Chase Bank, PNC Bank, Bank of America, Citibank, M&T Bank, BB&T, Wells Fargo, TD Bank, Bank of the West, and US Bank. 7-Eleven and Western Union also accept credit cards. Even if the option to pay with a credit card is available with an institution or outlet near you, you should consider the cost involved. A credit card company typically looks at a payment towards money order as a cash advance. It can, thus, attract a cash advance of around 5% of the amount. However, this is not the only additional charges. You will also have to add the higher interest rates that come along. So if you are buying an order of $1000, the cash advance fee charged by your credit card company can be as high as $50. And the fee paid to the outlet or bank will be additional. So using your credit card is not a smart choice if you have the cash. Besides, you shouldn’t expect any rewards on your card when making this purchase. 9. What Happens if You Lose it? They come with some level of safety and reliability for the funds. You can cancel an order, before it has been cashed, either to issue a new one or to get a refund. If it has been cashed fraudulently, you can take steps for a refund. If it has not been cashed, you can contact your issuer and fill a form. You will be required to have your receipt and provide details in the form such as the tracking number, purchase date, amount, and the location. Even if you don’t have the receipt, you can fill up the form. The issuer may also require you to provide information about how you lost it. If you have the receipt, it is recommended to attach its copy. The issuer is going to charge a fee for the cancellation process. Western Union and a few other issuers can also allow you to send the cancellation form through fax, mail or email. Western Union charges $15 if you have the receipt. Without receipt, they charge you $30. MoneyGram orders can be cancelled with a fee of $18 at Walmart while USPS charges $5.95. The issuer verifies the information on the form and checks if the order has been cashed or not. If it has not been cashed, they will issue a new one and send it or process a refund, based on your requirement. If your money order has been cashed, it is highly likely that there may not be a refund. There are, however, ways in which you may be able to collect your money. You can ask for a photocopy of it once it has been cashed. If you find any signs of fraudulent act, you can contact the law enforcement authorities. 10. What are Some Tips to Avoid Fraud? Fill the Payee Name: The simplest thing you can do is to fill the payee’s proper name on the form. It is also important that you give it to only those whom you trust. Recipient: When you receive a money order, you should immediately cash it. Another option is to deposit it into your savings/checking account so that you don’t lose it. Avoid Advance Fee Loan Scams: If you come across loan ads that claim to offer you loans even for poor credit score and with low APR, you should avoid them. Most of them are scams that require you to send them a fee through this vehicle. Avoid Fake Check Scams: There are scammers who send you check while asking to pay a fee through the transaction. The check can take weeks to process before you find that they were fake and the bank is going to force you to refund the amount. Online Purchase: You should never purchase anything online by first sending the payment through money order. Look for an escrow service or use your credit card to stay secure. Avoid Paying Telemarketers: If a telemarketer asks you to send money, you should avoid them. It is illegal under the Telemarketing Sales Rule for them to ask you to send cash. If you think that you have sent the money to a fraudster, you should immediately contact your issuer and file a complaint and ask it to be cancelled. 11. Can I get a Money Order Online? Yes, you can buy one online, but there are very few options. Most of the traditional outlets such as banks, credit unions, and grocery stores don’t offer this benefit. One reason for this limitation is that this mode of using this service is relatively new. There are a few services like Payko and Xoom that do provide the option. The transaction fees can, however, vary from one place to another. Payko: Payko allows you to send online versions by paying from your PayPal account. The PayPal account can be loaded with your credit/debit card or bank account. However, the limitation of being able to send only $200 a day may not make much sense for many users. The online service also doesn’t allow any physical transactions. Besides, the company charges anything $3.49 up to 5.49% of the amount. Xoom: Xoom is a subsidiary of PayPal and carries more sense of reliability. It allows you to send them by paying through your bank account or credit card. You can also send international versions. Its network comprises of partnerships with thousands of payout services and banks in 30 countries. It charges a fee starting from $4.99 per order. It is recommended to choose an online company only after thorough research to ensure reliability. You’re on our Money Order page.